Disclosure: We received an Ozeri Ultra Wind 42″ Adjustable Oscillating Tower Fan to facilitate an honest review. No monetary compensation was received! All opinions stated are those of the Shelly's Bits & Pieces family. My mother always says that I am one of the most hot natured people she has ever known. I am rarely cold, and I sleep with a fan on year round. 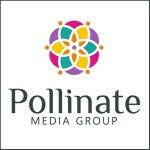 The fact that I started going through menopause when I was in my mid 30's didn't help the situation any, and here I am at 48 and am still having my own private summer, year round! A fan is a necessity to me, and the only problem I have is finding one that actually does everything it claims to do! Several months ago, I was offered the chance to review the Ozeri Ultra Wind 42" Oscillating Tower fan. 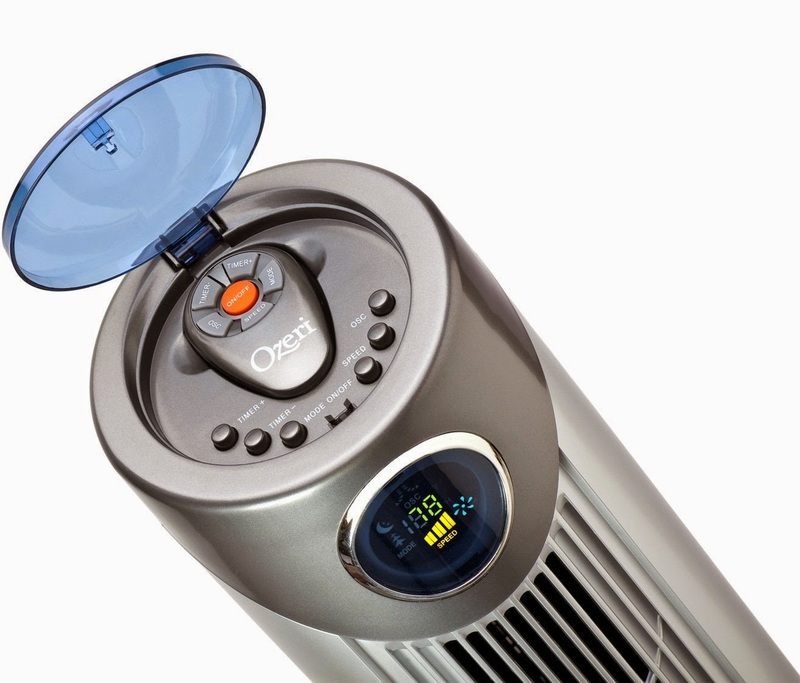 Designed for 5 Star resorts, the new Ozeri Ultra 42" Tower Fan boasts a sophisticated and stylish ultra-slim design and one of the most impressive feature sets among tower fans. The Ozeri Ultra Tower Fan's stylish design complements and enhances room decor, and its precise engineering generates more air velocity than competing models while emitting less noise on a foot-per-minute to dB basis. Setting a new benchmark for noiseless airflow, the Ozeri Ultra Tower Fan operates at 3 whisper-quiet speed settings and oscillates 90 degrees for timely relief on a sweltering summer day or for refreshing circulation all year long. The Ozeri Ultra Tower Fan also includes 3 selectable airflow patterns designed to foster sleep, relaxation and comfort. All of the Fan's features, including a room temperature display, are illuminated on the Fan's multi-colored bright LED screen, and can be activated via the included enhanced-range remote or via the built-in control panel. 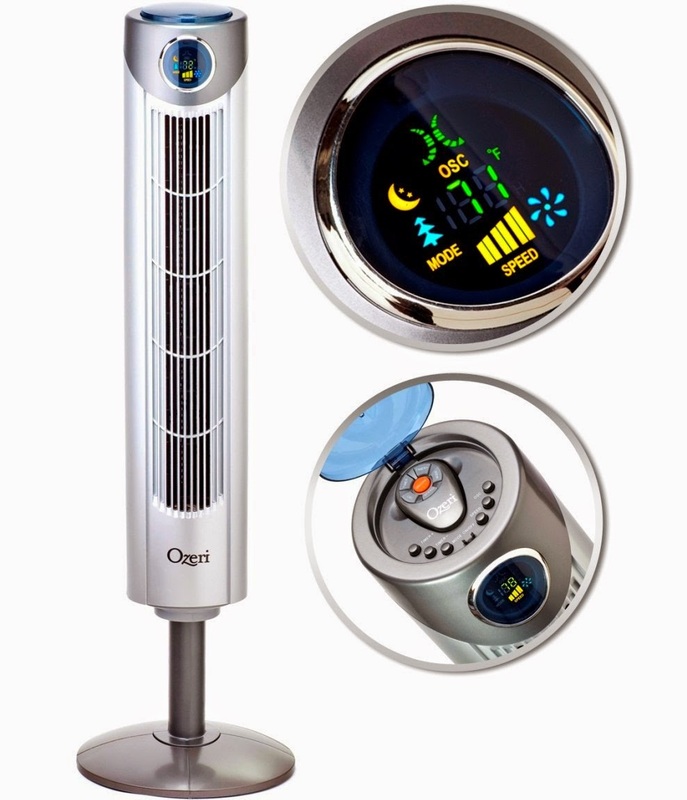 The Ozeri Ultra Tower Fan also features a 12 hour timer that can be programmed in 1 hour increments with push-button ease, and ships included with a removable extension column that adjusts the Fan's height from 32" to 42". I read about the fan and was so excited to try it! Fast forward to Friday, April 10th...I went into the attic (which I NEVER do) to put away some winter coats and sitting right in front of my wardrobe was a box that was holding my (wait for it) Ozeri tower fan!! I have no idea when it came in, nor do I know who placed it in the attic. Both Chefy and Kat claim ignorance! I brought the box downstairs and I was stunned at how easy it was to assemble! It was basically assembled in the box. All I had to do was screw in the extension column and the base! Super EASY! It only took me a few minutes and my new fan was cooling me off! It has a remote control that I keep on my end table in the living room. I love that I can turn on, change speed and setting, and turn on/off the oscillating function. The fan has a thermometer which I dearly love. I always wondered if it was truly hot in a room, or if it was a hot flash. Now I can find out without asking anyone else if they are hot! One thing I was concerned about was how quiet the fan actually was! I had no reason to worry because the fan is whisper quiet. Many of the old fans we used were so loud that I had to turn up the volume on the TV. I don't have to do that anymore thanks to my Ozeri Ultra Wind 42" Adjustable Oscillating Tower Fan!! 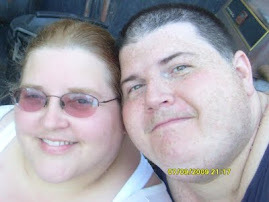 I love all the icons on the LCD screen, and when you use the Ozeri Ultra Wind 42″ Adjustable Oscillating Tower Fan in a bedroom, the night mode function will keep all icons on the LCD screen dimmed except for the moon icon. This was perfect for me, because the least bit of light can keep me awake at night. I am very thankful to Ozeri for the fan they sent for me to review. It is awesome! I wholeheartedly recommend this fan to anyone who is in the market for one. It does everything it claims to do and would be the perfect fan to keep your home cool this spring and summer!